The Natural History Museum in the UK has shortlisted its nominees for the 2016 People’s Choice Award for wildlife photography. From playful polar cubs to the horrified last gaze of a wildebeest calf, these images are guaranteed to astound. Voting for this year’s competition ends on January 10, 2017. You can cast your vote for best wildlife photographer here, and be sure to share your favorite with @NHM_WPY on Twitter using the hashtag #MyWPY. This female polar bear was resting with its two young cubs in Wapusk National Park, Manitoba, Canada, when it suddenly got up and rushed downhill through the deep snow. One of the cubs jumped on to her, holding onto her furry backside with a firm—and unexpected—bite. After taking this stunning photo, Bence Máté recalls how chilling it was to see the frightening, killing eyes of this 13 foot-long (4 meters) Nile crocodile. This croc was baited with natural carcasses on an island in the Zimanga Private Game Reserve, South Africa. Snow geese look like ghosts in the pink early morning light as they land among sandhill cranes in the Bosque del Apache National Wildlife Refuge, New Mexico, USA. Photographer A. M. Renodier was on a wintertime visit to Japan’s Jigokudani Snow Monkey Park when he took this poignant photograph of a sleeping baby Japanese macaque, its mother’s hand protectively covering its head. Photographer Stephen Belcher spent a week photographing golden snub-nosed monkeys in a valley in the Zhouzhi Nature Reserve in the Qinling Mountains, China. The monkeys have very thick fur, which they need to withstand the freezing nights in winter. This image shows two males about to fight, one already up on a rock, the other bounding in with a young male. The photographer saw this wildebeest calf shortly after it was born in the Kgalagadi Transfrontier Park, South Africa. 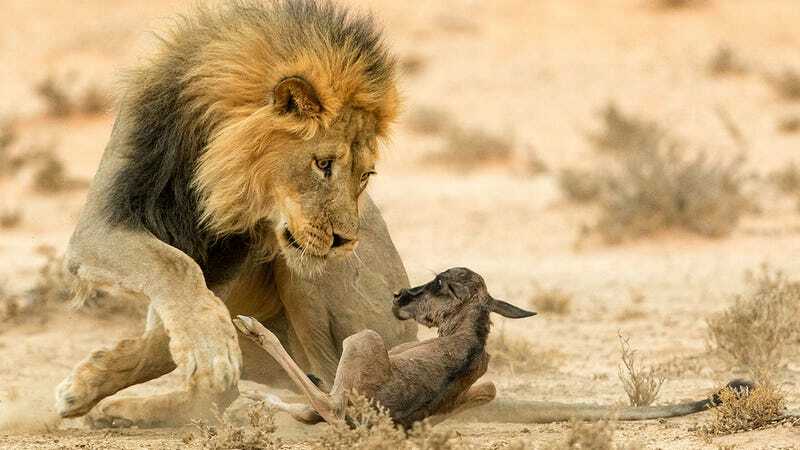 Little did he know that he would witness its death later that same day; the small herd of wildebeest walked right past a pride of lions and the calf was caught by a lioness and then taken by this male lion. Photographer Tapio Kaisla took a trip to Dovrefjell–Sunndalsfjell National Park, Norway, to find these magnificent oxen amid their natural habitat. Even though spring is not rutting season for these animals, they were already seriously testing their strength against each other and the air rang out with the loud bang of the head-on collision between these two beasts. During a dive off the coast of Tulamben, Bali, Indonesia, photographer Sergio Sarta was scanning a volcanic, dark grey, sandy seabed when he saw a bright-colored organism—a fire urchin with a pair of tiny Coleman shrimps. The fire urchin has quills that are very toxic to humans, and the shrimps avoid this danger by seeking out safe areas between the quills. Photographer Andrea Marshall was snorkelling off the coast of Mozambique when she came across hundreds of large jelly fish. Many were covered with brittle stars—opportunistic riders, taking advantage of this transport system to disperse along the coast. It was breeding season, and all the male turkeys were putting on a show for the females, but a number of birds seemed a little confused. This one was more concerned with the potential suitor in front of it, not realizing it was its own reflection. Photographer Bernd Wasiolka encountered a large lion pride at a waterhole in the Kgalagadi Transfrontier Park, South Africa. One of the two males spray-marked the branches of a nearby tree. Later two females sniffed the markings and for a brief moment both adopted the same posture. During the summer months, 20 million Mexican free-tailed bats arrive at Bracken Cave in San Antonio, Texas, USA, to give birth and raise their young. Each evening at dusk, the hungry mothers emerge into the night in a vortex, circling out through the entrance and rising into the sky to feed on insects. The kingfisher frequented this natural pond every day, and Mario used a high shutter speed with artificial light to photograph it. Photographer Ally McDowell often focuses on colors and patterns underwater—this “pattern” being the eye of a parrotfish. Sabella spallanzanii is a species of marine polychaete, also known as a bristle worm. The worm secretes mucus that hardens to form a stiff, sandy tube that protrudes from the sand. It has two layers of feeding tentacles that can be retracted into the tube, and one of the layers forms a distinct spiral. The Dalmatian pelican, seen here on Lake Kerkini, Greece, is the largest species of pelican in the world. It is native to eastern Europe, Russia and Asia, however, its population is currently threatened in some areas from hunting, water pollution and habitat loss, particularly a decline in wetlands. Photographer Rudi Hulshof wanted to capture the uncertainty of the future of the southern white rhino in the Welgevonden Game Reserve, South Africa, because of poaching. He anticipated the moment when these two rhinos would walk past each other, creating this silhouette effect and the illusion of a two-headed rhino. Shortly after purchasing the Giraffe Manor in Nairobi, Kenya, the owners learned that the only remaining Rothschild’s giraffes in the country were at risk, as their sole habitat was being subdivided into smallholdings. So they began a breeding program to reintroduce the Rothschild’s giraffe into the wild. Today, guests can enjoy visits from resident giraffes in search of a treat. The photographer was at Lake Kerkini, Greece when he saw this caterpillar on a flower, so he encouraged it onto a piece of rolled dry straw. He had to work fast because the caterpillar was constantly moving. In this photo, the bird’s wing acts as a diffraction grating—a surface structure with a repeating pattern of ridges or slits. The structure causes the incoming light rays to spread out, bend and split into spectral colors, producing this shimmering rainbow effect. Cold temperatures on Shodoshima Island, Japan, sometimes lead to monkey balls, where a group of five or more snow monkeys huddle together to keep warm. The photographer climbed a tree to get this image. Gunther Riehle arrived in Antarctica during sunshine, but by the evening a storm picked up. Initially just strong winds, by the early morning snow had arrived. He concentrated on taking images of the emperor penguin chicks huddled together to shield themselves from the force of the snowstorm.